Jean Braithwaite, associate professor of creative writing, is seen during her presentation on comics as literature during FESTIBA on Tuesday at the University of Texas Rio Grande Valley in Edinburg. EDINBURG — When one thinks of resources to improve literacy, comics might not immediately come to mind. There is more to literacy, however, than classic novels. The University of Texas Rio Grande Valley is on to that. 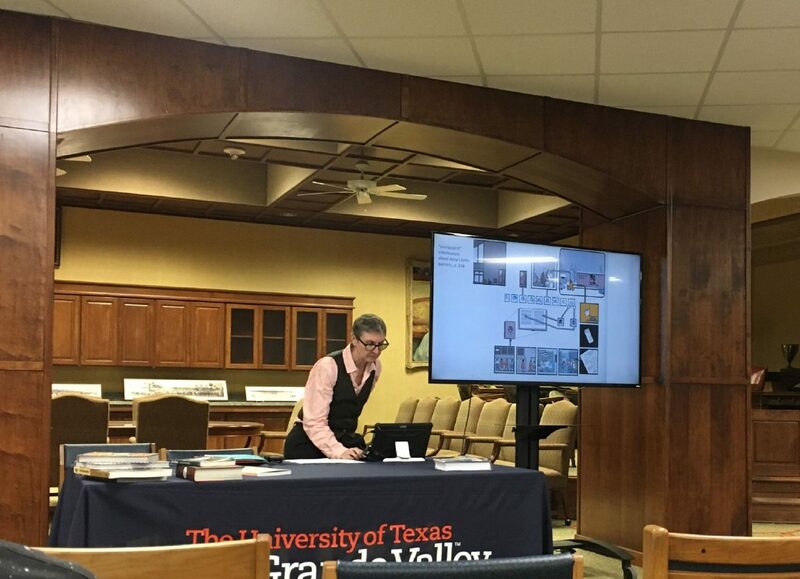 On day two of the 12th annual FESTIBA celebration, six academic sessions discussing comics as literature and art were hosted inside the Shary Room in the University Library on the Edinburg campus. After relocating to Texas from Arizona in 2006, Braithwaite helped introduce a creative writing program at the university. She then pushed to have comics courses added to the curriculum and had her wish granted. Her presentation was filled with “top secret insights” of the narratology and cognitive science of literary comics. It also featured a case study on Chris Ware’s comics, whom she proclaimed to be her hero. A flat-screen monitor to Braithwaite’s left projected images of the comics discussed. She pointed out Freudian overtones, page structure and multiple dimensions the images reflected. As an additional project to her “groundbreaking research,” she is writing a book on Ware and has her students studying his works in her courses. “Students are often surprised how difficult it is to read and understand a literary comic,” Braithwaite said. Braithwaite posed a challenge for UTRGV. If the university were to introduce a comic track into their MFA programs, it would move to the “cutting edge,” she said, as only a handful of universities are offering such. From her experience, students and human brains in general, love comics. FESTIBA panels will continue through March 3. For information on the sessions and speakers, visit UTRGV.edu/FESTIBA.